New solar installations in 2019 – get ready to support our share offer – please help us gauge local interest by completing this short survey by 10th March – once we have thirty responses we will make a donation to Trees for Life, who plant trees in the Scottish Highlands. Last year, 2018, was the second sunniest UK year on record according to the Met Office, with 1,575 hours of sunshine landing on our solar panels. We generated 445,876 kWh of electricity, more than 10% above that predicted in our share offer documents. Dorset Community Energy (DCE) members benefitted from an interest payment of 5.5% in September. 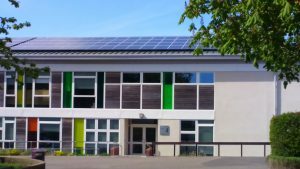 More solar installations on schools expected in 2019, your chance to support! Help us gauge local interest by completing a short survey, read the article and find the link below or do it now! Please complete by 10th March – once we have thirty responses we will make a donation to Trees for Life, who plant trees in the Scottish Highlands. If you were at our AGM, you will have heard that we won a grant application to the Rural Community Energy Fund to meet the costs of technical and feasibility studies for a new round of solar photovoltaic panel installations on schools. The feasibility studies are now almost completed. Six schools and five hospital sites have expressed interest and have been assessed as feasible using a similar financial model to our existing installations, and we expect to issue a share offer soon. Dorset Community Energy (DCE) also secured funding from the Rural Community Energy Fund to carry out a feasibility study to supply solar photovoltaic electricity to 53 new homes being developed by Bridport Co-Housing and designed to Passiv House specifications. DCE appointed consultants Wessex Energy Solutions (WES) to conduct the study, which has shown that using a standard model of installing panels onto homes and selling electricity to the householders would not be financially viable, however installing an array of panels whose electricity is shared across the houses, by a micro-grid, backed up with a storage battery is financially viable. If you are considering installing solar photovoltaic panels, or any other renewable electricity technology on your home then you need to act quickly as the Feed-in Tariff will close to new installations on 31st March 2019. We are intending to hold our AGM in July 2019, date and venue to be confirmed.. If you are interested, do read this article and complete the survey (link below), or if you are too busy – go straight to the survey Please complete by 10th March – once we have thirty responses we will make a donation to Trees for Life, who plant trees in the Scottish Highlands. Blandford School wishes to add capacity. The feasibility studies are now almost completed. Six schools and five hospital sites have expressed interest and have been assessed as feasible using a similar financial model to our existing installations, members will be invited to purchase shares and will receive annual interest payments and the investment capital back in instalments over a 20 year period. DCE appointed consultants Wessex Energy Solutions (WES) to conduct the study which has shown that using a standard model of installing panels onto homes and selling electricity to the householders would not be financially viable, however installing an array of panels whose electricity is shared across the houses, by a micro-grid, backed up with a storage battery is financially viable. WES worked with microgrid experts Clean Energy Prospector (CEPRO). Of course you can install solar photovoltaic panels without the Feed-in Tariff, but to get the best return from your investment you will need to use the electricity when you generate it, i.e. in the day-time! The Feed-in Tariff is designed to reward you for feeding electricity into the grid. We are intending to hold our AGM in July 2019, date and venue to be confirmed. Thank you for opting in to the Dorset Community Energy newsletter – this is our first newsletter since the 25th May 2018, the date the new General Data Protection Regulation came into force, you are one of 109 people who opted in! AGM – Tuesday 17th July 2018 – Why you should come? ⦁ A chance to visit the recently re-opened Literary and Scientific Institute. ⦁ You get to vote on the interest payment and to elect your Directors, or even become one yourself. (If you can’t come do use your proxy vote that we have e-mailed to you). ⦁ You’ll hear about the work we are doing to investigate new renewable energy projects in Dorset. 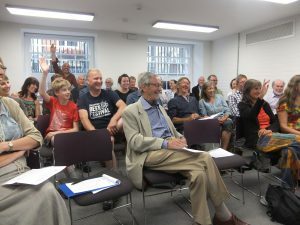 The AGM will be held at the Literary and Scientific Institute at 51, East Street, Bridport, DT6 3JX on Tuesday 17th July, from 19:00 to 20:30 with finger buffet available from 18:30. On 25th May during a visit to Dorset, Prince Charles officially opened the new Literary and Scientific Institute building in Bridport. Tim and other local people have spent several years raising funds for the historic building which has been refurbished to a high standard. The Institute now includes a spacious café , office accommodation and meeting rooms for local businesses/ community organisations. 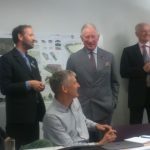 During his tour of the building Prince Charles met Tim and discussed local community-led initiatives including Dorset Community Energy and the Bridport Co-Housing project. Prince Charles mentioned that he supports solar panels on schools and industrial buildings and Tim explained that Dorset Community Energy has supported educational activities including at Damers School in Poundbury.